Django app structure is an implementation of seperation of concerns. It is slightly different than what you can find in other MVC frameworks. The stack is split vertically, not horizontally. And then the app is split horizontally within, i.e. models, views, templates etc are in their seperate modules/packages/directories. This vertical splitting allows you to collect all ingredients of one functionality in your project in one place. Don’t be afraid of multiple apps. I will focus on flexibility and interoperability of apps in this post. But before we proceed I would like to emphasize the first bullet point in the slide. Because the scope of your app plays a big role in its flexibility and interoperability. Apps should be small enough to easily understand and integrate (into a project). Many times I have moved away from an otherwise good app because of its many dependencies and/or excessive features. On the other hand apps should be big enough to allow for different configurations and allow extension without modifying their code. Do one thing, and do it well. Take django-tagging for example; it’s 1.3 KLOC but it does tagging and nothing else. There are no dependencies other than Django, you can add tags to any model without modifying the model source, a tag can be associated with any type of model and tagging hides the gory details from you… In short; finding the right size is important. This is why tagging is the tagging app for Django. General advice is “even project specific apps should be reusable”. Slapping the same app onto another project is not the only advantage. In fact it may not be possible if you are not in the habit of upgrading your whole project to recent versions of Django. The main advantage as I have said before is sanity. 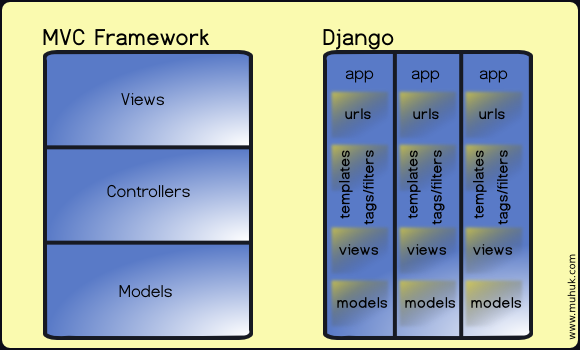 I prefer Django to other web frameworks/environments because it provides a civilized way of development. Let’s accept it; web programming is not a particularly interesting, exciting or intellectually rewarding field. You write the same piece of code over and over. And worst of all the challanges you face are actually a result of either the underlying system was designed by morons or you are trying to use it for something it’s not intended to be used. So it is only natural that web programmers feel they’re rusting. Django eases the pain. If you stick to certain conventions serenity will follow as well. Naturally the framework does most of the work regarding app flexibility and interoperability. Take URLs for instance include('myapp.urls') and you are good to go. You don’t have to bind views one by one. Is it inflexible? Who said urls.py can only contain a hardcoded list of URLs. You can do anything that is possible with Python. You can generate different urlpatterns based on a setting for instance. It is relatively easy and straightforward to reuse and extend forms and views (both function based and class based). Models are a little harder to get right though. You should always think of the most difficult situation which is you can’t touch either app’s code. Registration pattern of admin app provides a good solution here. You can register a third party model to another third party app in just a few lines. You don’t need to write lots of code to get the flexibility and interoperability. Well designed apps make good use of settings.py for example. Why should the project developer wrap a view when a single line assignment would do the job? Supplying good templatetags and template snipplets (includes) is another way to make things easy for app consumers. Signals provide a great way to propagate the events generated from your app. Even though they are one way2, signals are extremely powerful. Any number of observers can connect to a signal and you can send a signal anywhere in your code. Literally. It is even possible your app suppying a signal and then another app sending it3. There are many more ways to tame your app to be reusable. It all starts with your determination and discipline. Just like documentation, testing and maintaining a software generally. I will write more about reusable apps. Next part is Developing Reusable Django Apps: App Settings. 1: The word application is used both for a web application and a Django application. To avoid confusion I always use app to indicate the latter. 2: Signals don’t have return values. But you can use a callback AFAIK.